If your child has ever had trouble sleeping, you’ve probably lived first-hand what researchers have proven: when a child doesn’t get enough sleep they can develop problems with behaviour, attention, learning or memory. While much of the research in this area has focused on children’s brain development, there has been growing evidence in recent years that shorter sleep times may also be connected to physical health problems such as obesity, diabetes and cardiovascular disease. In fact, one study of teenagers showed that with each hour of sleep lost, the odds of becoming obese went up. That’s not to say that a child who doesn’t get enough sleep will become overweight or develop diabetes, but lack of sleep can create changes in a child’s normal development and may affect their energy levels, eating habits and willingness to take part in physical activity—all things which play a role in a child’s overall health. When a child or teenager is sleeping, the body produces the hormone that promotes normal growth. This hormone also helps repair cells and tissues. The body also produces other hormones while sleeping, such as the ones that signal when we are hungry or full, and others that help regulate blood sugar levels. Lack of sleep can cause these hormones to be out of balance. Sleep also plays a role in maintaining a healthy immune system, which helps the body fight against infections. When a child is not getting enough sleep, their immune system may not be strong enough to keep colds and flu at bay. 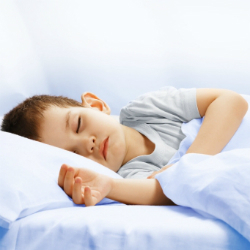 The Canadian Paediatric Society has recommendations on how much sleep your child needs at different ages. Whether your child is four or fourteen, getting them on a regular sleep routine will benefit their health and well-being. Set a regular bedtime and wake-up time in the morning, and encourage pre-bedtime routines such as reading a book to your toddler, or asking your teen to turn off the TV and computer half an hour before bed. Your children will also take cues from you about sleep and sleep habits. Even though they’re going to bed before you do, it sets a good example if they know you have a regular bedtime hour and wake-up hour too. To make an appointment: As of October 24th, 2016, requests for consultation in general pediatrics must be sent to the Centre de repartiment des services (CRDS). For questions about referring a patient to our service, please call 514-412-4400 ext. 22338.